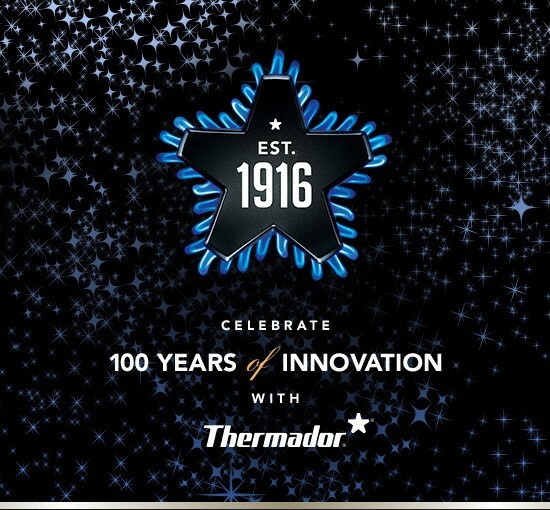 In 2016, Thermador will celebrate 100 years of creating Real Innovations for Real Cooks. To demonstrate the evolution of kitchen personalization, unveil upcoming trends and showcase new innovations, Thermador will kick off its milestone centennial celebration at Design & Construction Week January 19-22, 2016. The brand will be located within the International Builders Show (IBS), at booth C3837 in the Central Hall, and will share the booth with sister brands Bosch and Gaggenau. On Tuesday, January 19 I’ll be attending a luncheon hosted by Thermador for Modenus Blog Tour Las Vegas Bloggers to learn more about their new innovative products. Follow my Tweets and Instagram Posts for up-to-the-minute news. Thermador will also host a press conference and VIP reception in the BSH booth to unveil exciting news, as well as to officially kick-off the 100th Anniversary celebration of Thermador. In addition to the inspiring kitchen vignettes found throughout the IBS booth, Thermador innovation will also be featured within the 2016 New American Home, the official show home of IBS. 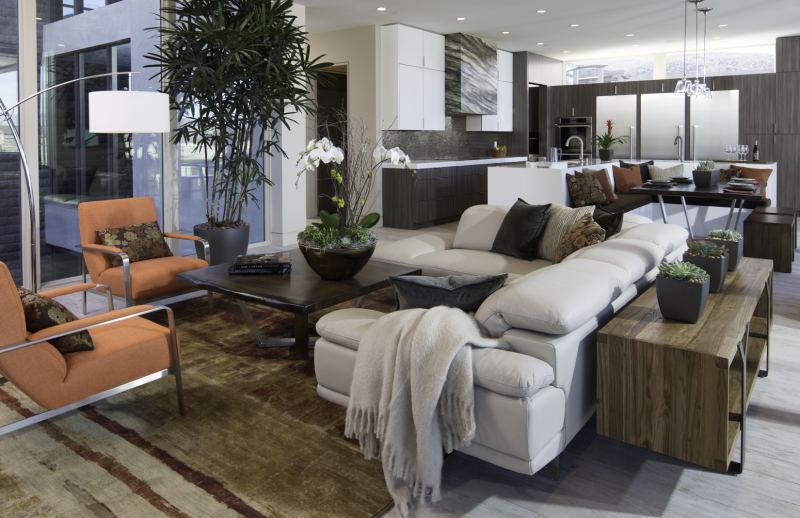 I’m really looking forward to seeing the innovative 5,200-square-foot 2016 New American Home. 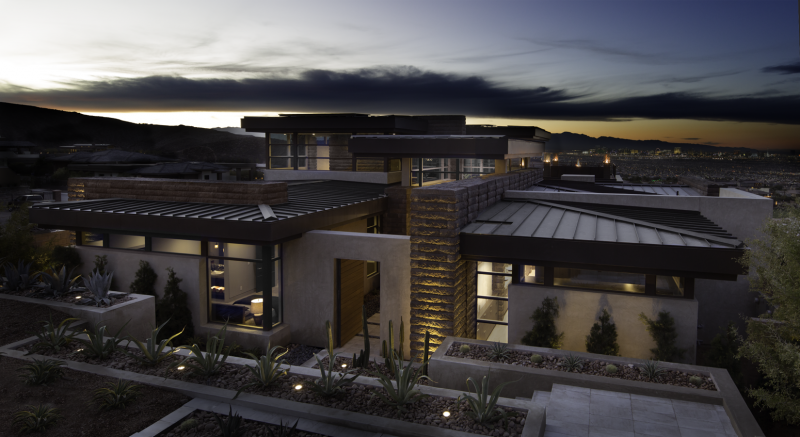 The New American Home, now in its 33rd year, showcases innovative construction technologies, emerging design trends and the latest building products. 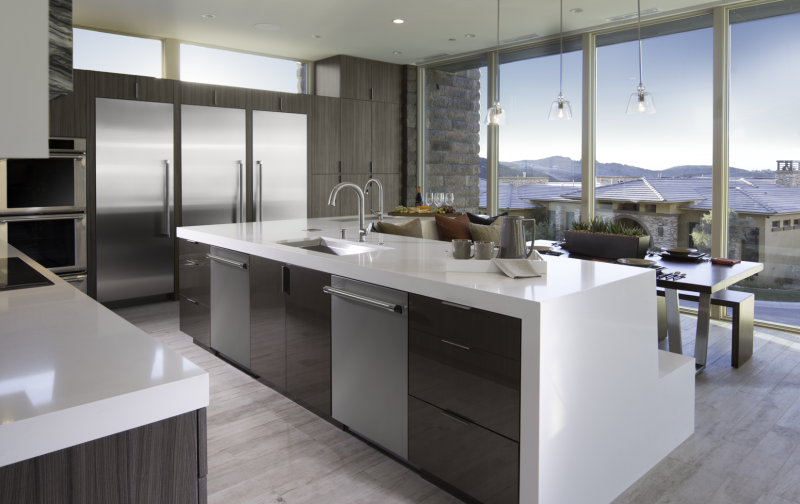 How amazing is this island with two Thermador dishwashers, waterfall edge and banquette? What is Active Cleansing Technology? Active Cleansing Technology sounds like something you’d see on the back of a bottle of bathroom cleaner – but it’s not. In 1967, Japanese scientists Akira Fujishima and Kenichi Honda (University of Tokyo) discovered the active cleansing effect of titanium dioxide in photocatalysis (the acceleration of a photoreaction in the presence of a catalyst). They researched this phenomenon, now known as the “Honda-Fujishima Effect”, and published their findings in 1972. Little changed in this research until the 1990s when engineers at TOTO collaborating with the University of Tokyo discovered the additional passive cleansing effect of photocatalysis. 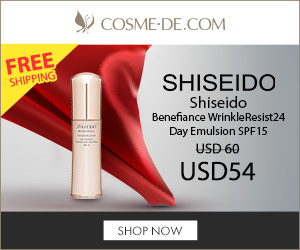 The additional passive cleansing effect is based on the hydrophilic properties of titanium dioxide. Surfaces treated with titanium dioxide dramatically reduce the surface tension of falling water. Instead of rolling off the surface as individual drops, the water flows off the edges in an ultra-thin film, which removes all dust and dirt particles in the process. You may be wondering why all this Science matters. In indoor applications (think bathrooms), this technology prevents the spreading of germs and bacteria and eliminates bad odors deriving from their action. 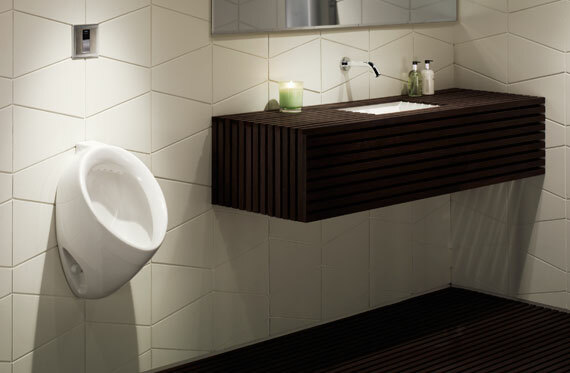 TOTO was the first company to use active cleansing technology. TOTO durably bakes HYDROTECT, a unique protective coating for ceramic building materials that renders surfaces self-cleaning; into their products. Because HYDROTECT is fired on to the surface separately from the glaze, it will not wash or wear off over time. It is not visible and, thus, does not alter the color of the product. 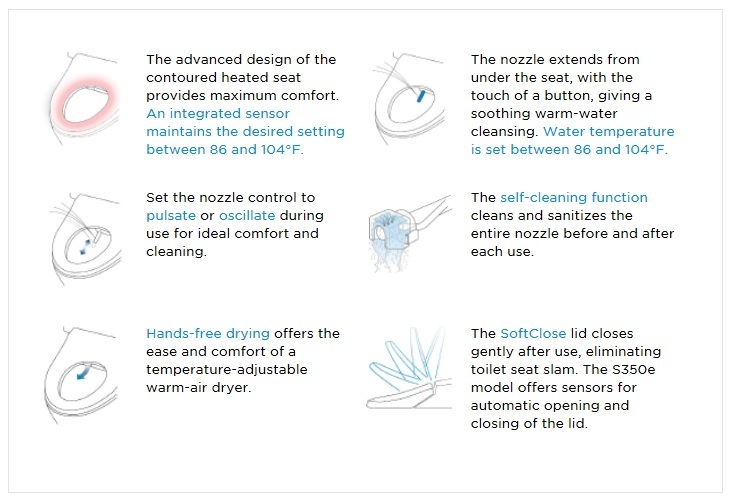 It’s reassuring to know every TOTO innovation has a single motivation: helping people feel cleaner and more alive. Being a technology leader has been good for TOTO. 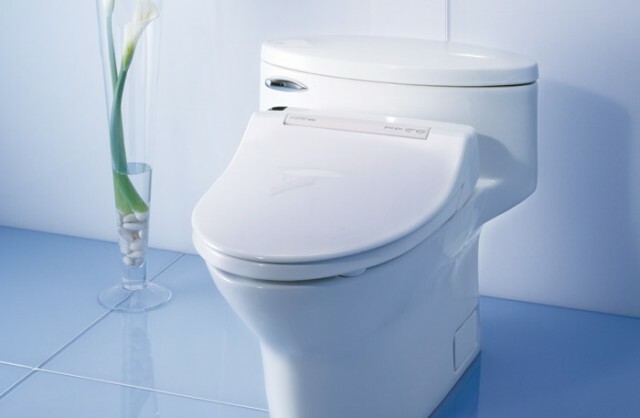 It’s no wonder this past November they reached an astounding total of 40 million WASHLETs sold world-wide since 1980. 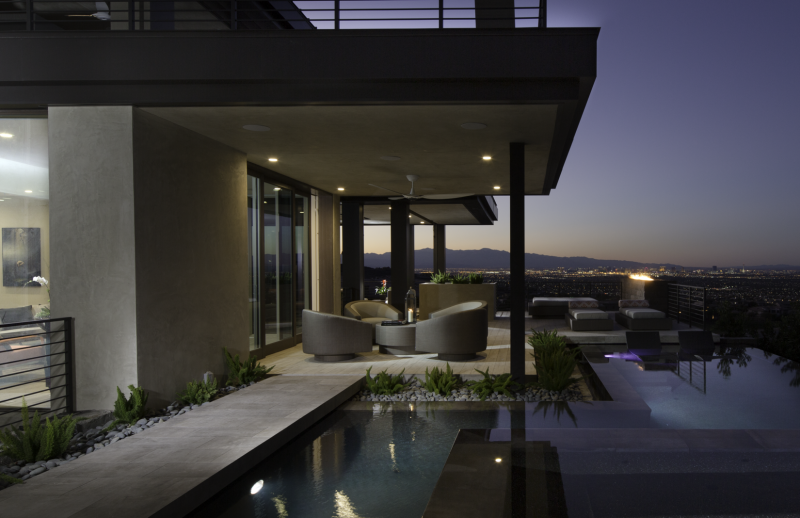 I look forward to visiting TOTO at Design and Construction Week in Las Vegas next month while I’m on BlogTour KBIS to see their new Connect+ System and eWater+. TOTO’s innovative Connect+ System neatly conceals the Washlet’s power cord and water supply hose for a clean installation. TOTO’s eWater+ mists the bowl with electrolysed water after every flush and once every eight hours during non-use. A pre-misting of plain water further enhances bowl cleanliness by sealing the surface against the adherence of matter approximately 80% better than dry porcelain. If you can’t make it to the Kitchen And Bath Industry Show this year you may want to check out these live streams from the show floor. Fisher & Paykel has a full range of programming scheduled including: appearances from America’s Test Kitchen’s founder Christopher Kimball, Chef Demos with Celebrity Chef Tim Creehan, and multiple virtual tours showcasing the newest innovative products from Fisher & Paykel and DCS Appliances. Another way to keep up with what is happening at the show is through KBDN Radio. Senior editor John Filippelli will be providing daily updates live from the show floor in a series of podcasts. Additionally, KBDN will be covering the KBIS Show live, through its Satellite Media Tour, hosted by KBDN editor Janice Costa. The Satellite Media Tour will start its broadcast live from the Broan booth at 6:30 a.m. on Friday, April 16. As the exclusive sponsor of KBIS, K+BB TV will go behind the scenes to showcase the new and innovative product launches from the show. K+BB will also conduct on-air interviews with some of the most influential leaders in the industry. My blog for GLAM.COM is up for you to read. I tried to highlight new products from various industry categories. It seems the new plumbing and appliances often get most of the attention. I hope you enjoy it. This picture is from the Silestone Party I attended. The DJ was rockin’ and many seemed to enjoy the Go-go Dancers. The food was also pretty spectacular. Thanks Silestone! Silestone introduced their new LIFE Series at the show this year. This expands Silestone’s offerings to 65 colors and 2 texture options. Protected by Microban, it is the only countertop that inhibits the growth of microbes such as odor-causing bacteria, mold and mildew on its surface with antimicrobial product protection. 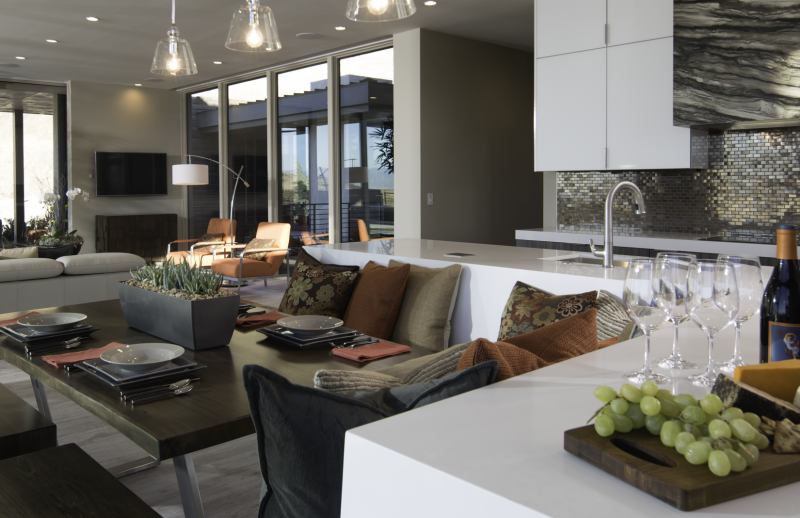 Silestone countertops are safe for the quality of interior air throughout their lifetimes, as they do not off-gas pollutants into the air and emit zero volatile organic compounds.